Casual wear is a necessity for autumn weather and T-shirts are among the most popular top selections women turn to for comfort and style. 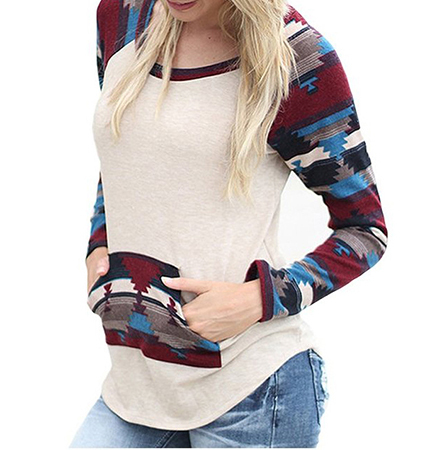 This great, comfortable t-shirt features long raglan sleeves with a multitude of colors in shades of burgundy, blue and gray with a pale beige body. A curved hemline displays your hips and the kangaroo pocket is a convenient place to stash your cell phone or change when you are out taking a walk. A round crew neckline feels soft around your neck in contrasting burgundy. Small size; 86 cm, waist 63 cm, sleeve length 55 cm, shoulder width 36 cm.